Raised to Life will be a night filled with beautiful music from 3 wonderful local artists. 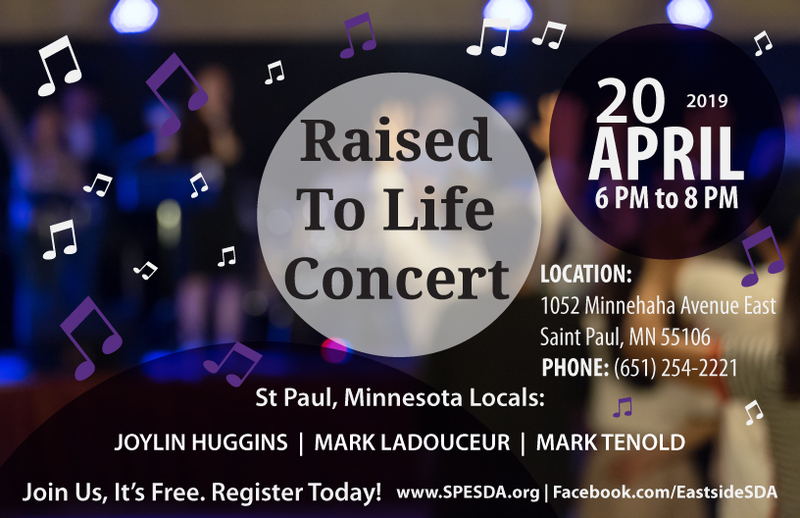 St. Paul Eastside Seventh-day Adventist Church will present Raised to Life Concert, taking place at the St. Paul Eastside Seventh-day Adventist Church for the first time this year! Raised to Life will be a night filled with beautiful music from 3 wonderful local artists. Raised to Life Concert will take place on April 20nd from 6 PM to 8 PM. The concert line-up will include Mark Tenold, Joylin Huggins, and Mark LaDoceur. Everyone is invited and encouraged to attend. Find out more about all these free event and ticket information at https://www.spesda.org/ or https://www.facebook.com/pg/EastsideSDA/events/.